In 2015, the American Planning Association (APA) named Laura Street one of the Great Streets in America. On October 4, during Art Walk Oktoberfest, the APA will unveil the official plaque! The unveiling will take place at 6:30 p.m. at the roundabout on Laura Street by the Jacksonville Landing. When MetroJacksonville.com presented the concept of “Lighting Laura Street” to former Councilwoman Suzanne Jenkins’ 2006 Downtown Action Plan Committee, Laura Street was a one-way thoroughfare in rough shape. Few businesses were open, lighting was poor, the landscape was unattractive, Hemming Park undesirable, and buildings were underutilized. Nevertheless, the basic concept of Lighting Laura was to use simple, affordable ideas and short term solutions to address issues limiting walkability, retail growth and the general image of downtown Jacksonville. 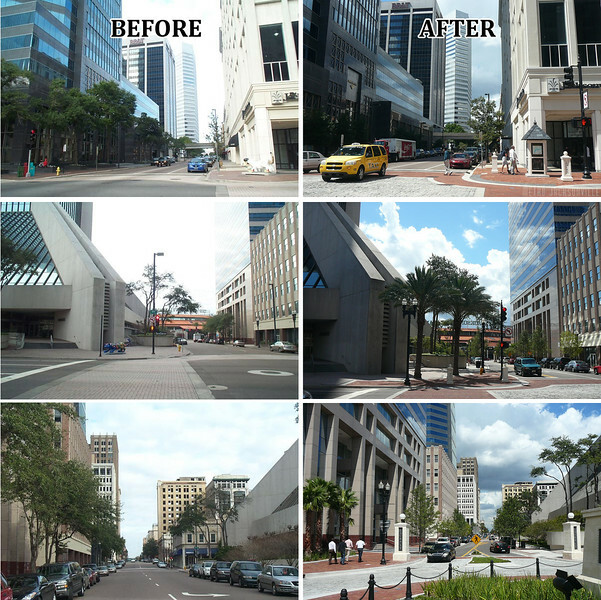 In 2007, many of those ideas were incorporated into the Jacksonville Economic Development Council’s (JEDC) Downtown Action Plan, leading to the 2011 completion of the Laura Street Streetscape project. After a decade of planning and implementation, Laura Street’s transformation was recognized nationally by the American Planning Association (APA). In 2015, the APA named Laura Street one of five Great Streets on their annual Great Places in America list. Since launching the Great Places of America program in 2007, APA has recognized several neighborhoods, streets, and public spaces around the country. Places are selected annually and represent the gold standard in terms of having a true sense of place, culture and historical interest, community involvement, and a vision for the future. Between Hemming Park and the Jacksonville Landing, Laura Street continues to rapidly transform into a hub of activity in the heart of downtown. Whether strolling around, grabbing a bite to eat, or attending the Art Walk on the first Wednesday of every month, at some point visitors of Downtown Jacksonville will find that exploring the Laura Street Corridor is inevitable. Pedestrians were central to the planning and development of the Laura Street Streetscape which features demarcated crosswalks that enhance the safety and accessibility of the street. Visitors can also access the area through the Skyway, an automated monorail train, at Hemming Park. The Jacksonville Landing, a riverfront hot spot for nighttime activity and festivals anchors the corridor four blocks to the south. However, Laura Street’s transformation is more than just a streetscape. 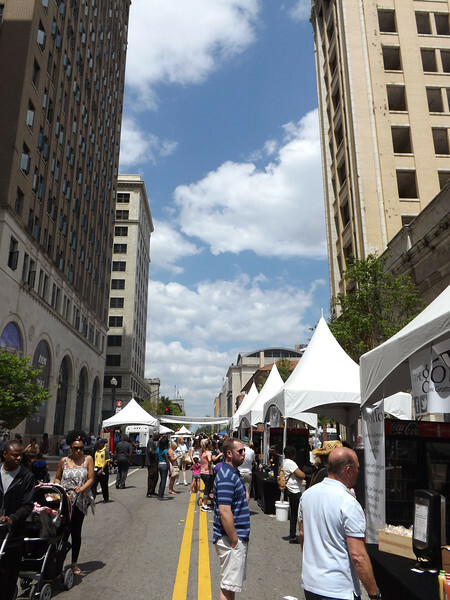 The programming of Hemming Park, dedication of community advocacy groups like Transform Jax and a regular rotation of special events and attractions like The Court Urban Food Park, Art Walk, and GastroFest stimulate needed pedestrian foot traffic that was non existent 10 years ago. 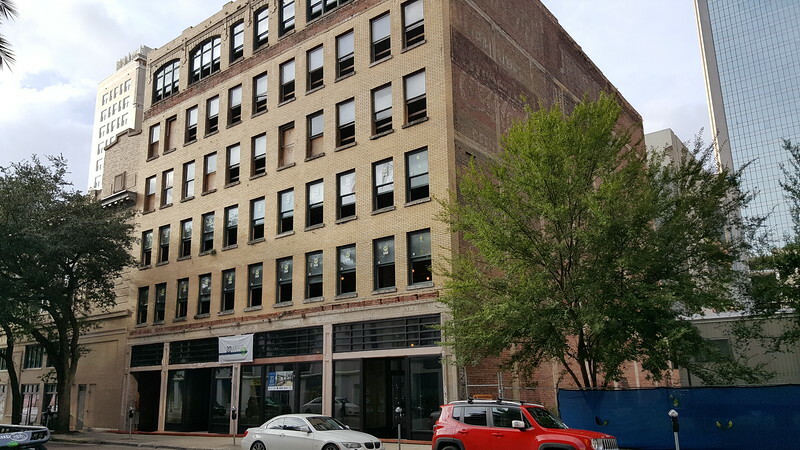 In addition, the Downtown Investment Authority’s Downtown Retail Enhancement Program has successfully assisted property and business owners with the cost of preparing or renovating underutilized commercial spaces in the area. New business openings along the Laura Street corridor in recent years include Jimmy Johns Gourmet Sandwiches, Urban Grind Coffee Company and Peterbrooke Chocolatier. Nevertheless, despite its recognition, Laura Street remains a work in progress. Soon, these businesses will be joined by the restoration of the Laura Street Trio into a Courtyard by Marriott hotel, the Barnett into a mixed-use project featuring 100 market-rate apartments, the renovation of the Lerner Shops Building into a restaurant and dorms for FSCJ and Tossgreen’s restaurant in the ground floor of the Suntrust Tower. 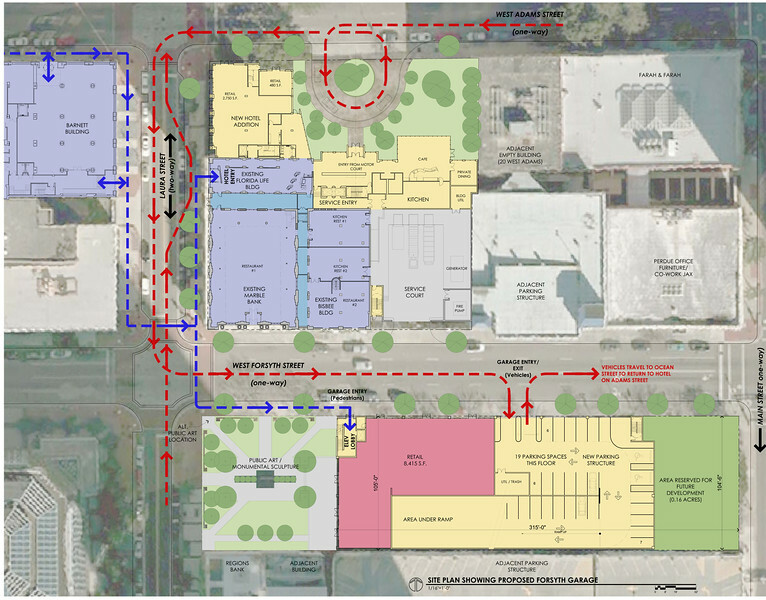 With these projects coming on line, Laura Street is very well be on its way to being a 24/7 unique North Florida-style walkable atmosphere. The Florida State College at Jacksonville (FSCJ) is in the process of converting the long vacant Lerner Shops Building into student housing. In honor of Laura Street’s national recognition, the APA, APA’s First Coast Section and Downtown Vision will unveil the official plaque! The unveiling will take place during Art Walk at 6:30 p.m. at the roundabout on Laura Street by the Landing.